A while ago a reviewed the Veet facial wax strips where I mentioned I had another product to test out soon too. Well I have done and I now have a few thoughts to share. The product is the Veet High Precision Facial Wax – designed for small, precise areas on the face. The kit comes with a tube (very much like a lipgloss tube) filled with clear wax, plus a plastic applicator (with a flatter end and a spikey end) and a packet of white paper strips to remove the wax with. I’ll put it out there straight away that this product didn’t work for me – and it’s a shame as I had high hopes for it. 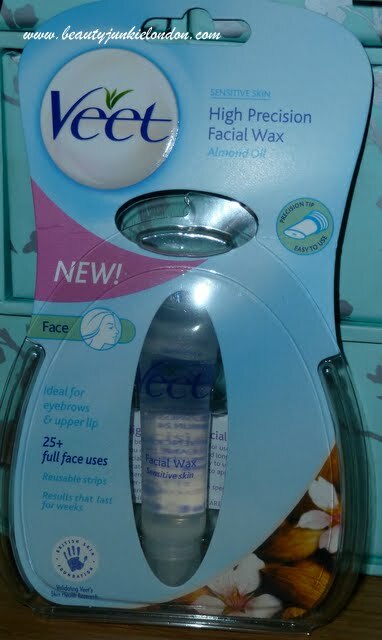 As with the Veet waxing strips I was using this to wax the fine, fuzzy hairs around and in between my eyebrows. I hoped that the slight niggle I had with the facial waxing strips would have been avoided – that being that I found it a little difficult to be precise with the placing of the strips as the paper got in the way (but thanks to a couple of tips from readers I have found my way around this). You have to warm the wax in a cup, then apply to wherever you are using it. I found the wax was quite sticky (or course, needs to be to apply to the hair) using the plastic stick to make sure the application is precise. Then using the strips to remove the wax and hair. My problem with this product may very well be down to my coordination, but I found them really fiddly to use. Because the wax was sticky I found I was getting stringy wax all over the place when trying to apply it. Which wasn’t really the main problem – which was that I found it almost just as difficult to be precise because the wax is see-through – you can’t really see where it is! I’m no product designer, but I would have thought that coloured wax would have been a pretty essential detail (have you ever seen wax in a salon that’s clear? That’s for a reason) so you can see where you are applying it. So I didn’t get on well with this and plan to stick to using the waxing strips. I could be tempted to try again if they update the product with coloured/tinted wax though as think this would make a significant difference to how easy the product is to use. I was really tempted in buying it but I wasn’t so sure the application was going to be easier as it says. Oh this was a complete turn down for me too!!! I usually love Veet products but this just didn’t work out. And considerind how expnsive it is I was super pissed! Sorry it didn’t work. Better luck next time! The high precision wax is awful! You should buy the normal wax strips and cut them into thin strips, they are much better to use for face! Glad you wrote about this as I was considering making a purchase! Clear wax is as useful as a chocolate tea pot. I had a very similar experience with this product.Tried this on my upper lip and eyebrows.Too fiddly and I couldn’t get it to pull out fine hair. I’ll be sticking to my good old wax strips that worked just fine.